after yesterday's shopping spree at H&M, now come the regrets, returns, and exchanges! 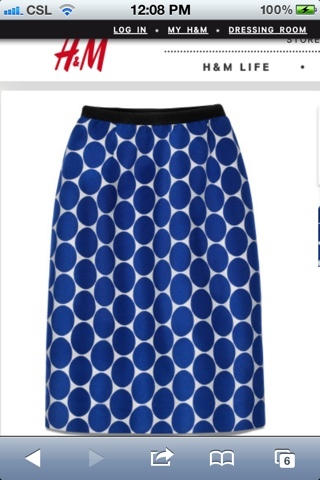 since i'm a skirt girl, one of my must-buys was the blue-dot slim skirt. as soon as I entered the store, i went straight for it. but i regret not trying it on!! but with only 10 minutes to shop, who has time?? to think i even researched my size on the H&M website. why oh why did I listen to the staff?? i asked, do you have a size 36? (because i couldn't find one right away) and she said, oh you're only a size 34; 36 will be too big for you. see how my looks (read: hips) can be deceiving? i tried it on back at the hotel and was horrified at how tight it was! so i went back to the store and wouldn't you know it--that style was gone!! huhuhu... so if there is anyone out there with a size 36 and would like to exchange it for a size 34, leave me a comment!! Hi how much are you going to sell the skirt po? email me at bulanday_faith@yahoo.com tnx. i'm gen by the way.